Living abroad is an incredible experience, and I have no intention of changing that anytime soon. Hamburg, my adopted city, is both very similar and very different to my home – Britain. It’s around this time of year when the pull of home starts to get stronger, for me at least. The dark nights, the thought of travelling back for Christmas. But…my flight isn’t just yet, so for now the food will have to do. One of my favourite and very quintessentially British winter recipes is the Great British Eggy Bread – just like mum used to make! It’s a simple combo – mostly milk and eggs (and bread of course) with a couple of twists on the classic. 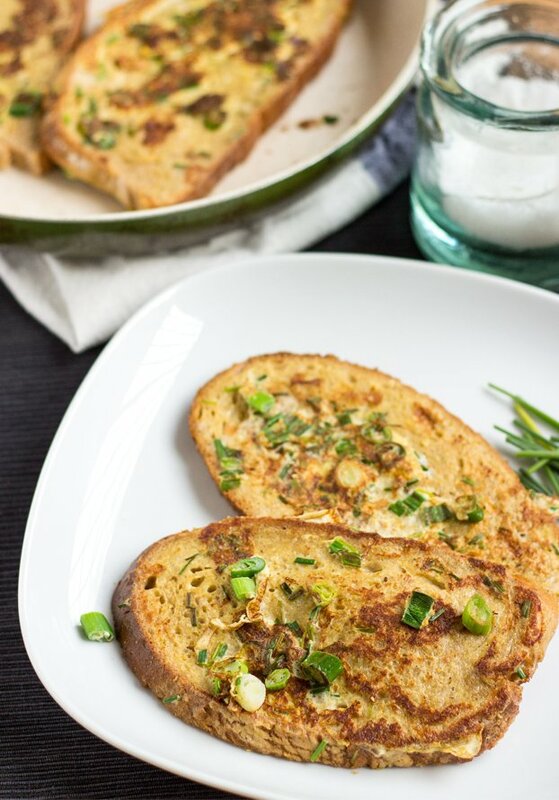 The chives and spring onions give it a bit more pep, and if you can get your hands on it then Marmite is what finishes this dish off (and makes it British). This week we’ll be mostly talking about eggs. They’ve been through the mill a bit, but are once again considered a healthy, great provider of protein to your diet. Eggs are the standard that protein is measured against, and contain all 9 essential amino acids. In fact the German word for ‘protein’ is ‘Eiweiss’ (egg white – thanks Howie). Eggs also contain all the B vitamins – B1, B2, B3, B5, B6 and B12, as well as betaine and choline – fantastic in working towards a healthy heart. The best news is that today’s eggs contain a much lower amount of cholesterol than even just a few years ago – mainly due to changes in the hen feed. On top of that you get plenty of vitamin D, zinc, copper and iron. To sum up? Eat an egg today! Unless you’re allergic. 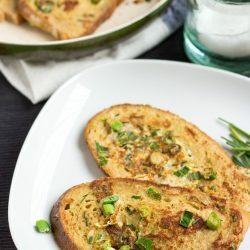 A Quick Eggy Bread Recipe. 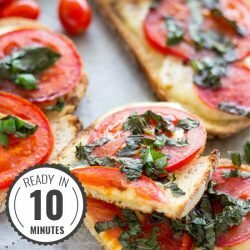 Simple but satisfying, and so very tasty. 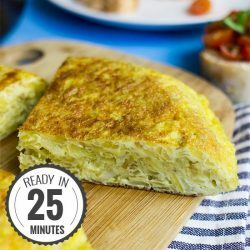 Ready in just a few minutes - why wait longer for a delicious and healthy breakfast? IF YOU LIKED THIS RECIPE: Peruse our Breakfast Section for some brekkie inspiration like this delicious 2 Ingredient Banana Egg Pancake Recipe. Second: The reason that eggs contain a “much lower amount of cholesterol” today than they used to is because the hen feed has changed. But it is lower in cholesterol because it has less good stuff in it. Most chickens nowadays survive on corn and soy, which does lower the cholesterol, but it also lowers everything else. Read Eating Animals by Jonathan Safran Foer if you are interested in learning more about this topic. Sorry, I’m not trying to be a smarty pants, but I do think everyone has the right to be well informed. Read beyond the labels. No worries, we appreciate feedback on our recipes! Yes, the other day I also read an article stating the new findings about cholesterol/eggs. We’ll have to update this section. Without the savory stuff and with a touch of vanilla, that’s what Americans call French toast. Uhh, Canadians call it French Toast too. Definitely minus the marmite.